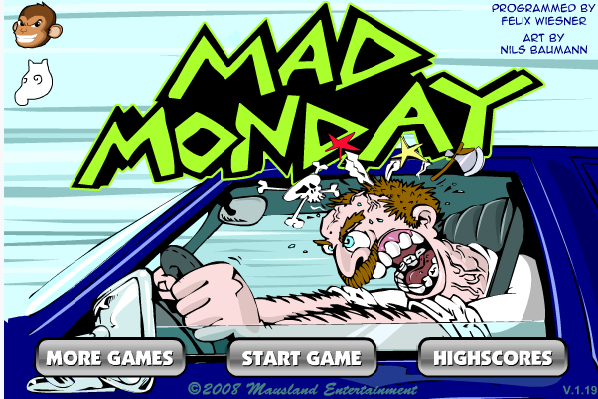 You’re late for work, or crime, or whatever, and of course it’s Mad Monday, and you’re psychotic! Run those other folks off the road, and shoot the rest! Pedestrian, no problem, thump thump! To score more ammo, the other cars have shell casings next to them, scoop those up too! On Mad Monday, use your arrow keys to steer, ^ to veer left, v to veer right, > to speed up, and < to slow down. Use your A key to shoot! Sorry Android and iPhone users, this is a flash game, you’ll have to play on your computer!